Patients with type 2 diabetes mellitus (T2MD) are at a high risk of developing heart failure (HF). The frequent coexistence of diabetes and other risk factors for ischaemic heart disease and HF such as hypertension and chronic kidney dysfunction (CKD)  makes T2MD a strong predictor of incident HF . The prevalence of T2DM is approximately 40% in patients hospitalized for acute HF . The presence of HF confers patients with T2DM a worse prognosis compared with HF individuals without diabetes . Of interest in this context is that some of the pharmacological agents used for glycaemic control in T2DM may increase the risk of incident HF. Whether this is the result of toxic effects on the heart or a consequence of their lack of effectiveness in controlling the metabolic problem is still a matter for debate. There have been no issues with metformin, the most commonly prescribed oral glucose-lowering agent worldwide and recommended as first-line therapy by the American Diabetes Association, The European Association for the Study of Diabetes, and International Diabetes Federation . Metformin has been used for over 50 years in clinical practice and it safety profile is well known , with evidence of survival improvement in patients with T2DM and coronary artery disease with or without HF. Concerns exist however about the use of sulfonylureas, despite the fact like with metformin, sulfonylureas have been used to treat T2DM patients for well over 50 years. Glibenclamide use has been suggested to be associated with an increased incidence of cardiovascular disease compared with other sulfonylureas, and it is therefore currently suggested that this agent should be avoided in patients at high risk of developing cardiovascular problems albeit it still remains unclear whether or not sulfonylureas are truly associated with an increased cardiovascular risk. 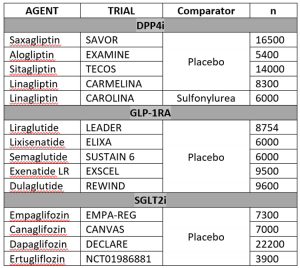 With the exception of the ongoing Cardiovascular Outcome Study of Linagliptin vs. Glimepiride in Patients with Type 2 Diabetes (CAROLINA) (NCT01243424) study , no other prospective comparative studies appear to be ongoing that could help resolving this controversy. Regarding the meglitinides (repaglinide and nateglinide), which reduce postprandial glucose ‘excursions’, these drugs are considered safe for use in the HF population, with no evidence of increased risk in cardiovascular mortality or serious cardiovascular events when compared with glibenclamide or gliclazide . The thiazolidinediones (pioglitazone, and rosiglitazone), which exert their metabolic (and cardiovascular effects) via activation of peroxisome proliferator-activated receptor-δ, should be avoided in patients with diabetes, as they enhance renal sodium and water reabsorption, and can cause or precipitate congestive HF. Novel agents used in the treatment of patients with diabetes are being subjected to intense scrutiny regarding their safety profile in terms of coronary heart disease, HF, hospitalization and death from cardiac causes, as summarized in the table below. Because of the different inclusion criteria, end-point definitions, patient sample size and duration of follow up in the above trials, a critical analysis of their results is needed, as it is unlikely that we will be comparing like with like. Among the studies shown in the table, the TECOS trial demonstrated Sitagliptin to have a good safety profile in patients with T2DM and HF  and, more recently, the EMPA-REG showed for the first time that an “anti-diabetes” drug reduced the relative risk for both cardiovascular and all-cause mortality . Very importantly, the 2015 joint clinical guidelines of the ADA and the EASD emphasize that the choice of blood glucose-lowering agent should focus on drug safety, especially focusing on hypoglycemia, HF, renal dysfunction, bone fractures, and drug-drug interactions . We are entering an era where cardiologists need to be aware of the cardiovascular issues associated with the use of anti-diabetic agents. Shehadeh A, Regan TJ: Cardiac consequences of diabetes mellitus. Clin Cardiol 1995, 18:301–305. Goyal A, Norton CR, Thomas TN, Davis RL, Butler J, Ashok V, Zhao L, Vaccarino V, Wilson PW: Predictors of incident heart failure in a large insured population: a one million person-year follow-up study. Circ Heart Fail 2010, 3:698–705. Joffe SW, Webster K, McManus DD, Kiernan MS, Lessard D, Yarzebski J, Darling C, Gore JM, Goldberg RJ: Improved survival after heart failure: a community-based perspective. J Am Heart Assoc 2013, 2:e000053. Mosterd A, Cost B, Hoes AW, De Bruijne MC, Deckers JW, Hofman A, Grobbee DE: The prognosis of heart failure in the general population: The Rotterdam Study. Eur Heart J 2001, 22:1318–1327. Inzucchi SE, Bergenstal RM, Buse JB, Diamant M, Ferrannini E, Nauck M, Peters AL, Tsapas A,Wender R, Matthews DR. Management of hyperglycemia in type 2 diabetes, 2015: a patient-centered approach. Update to a position statement of the American Diabetes Association (ADA) and the European Association for the Study of Diabetes (EASD). Diabetes Care 2015;38:140–149. DeFronzo RA, Goodman AM. Efficacy of metformin in patients with non-insulin-dependent diabetes mellitus. The Multicenter Metformin Study Group. N Engl J Med 1995;333:541–549. Huang Y, Abdelmoneim AS, Light P, QiuW, Simpson SH. Comparative cardiovascular safety of insulin secretagogues following hospitalization for ischemic heart disease among type 2 diabetes patients: a cohort study. J Diabetes Comp 2015;29:196–202. Zinman B1, Wanner C, Lachin JM, Fitchett D, Bluhmki E, Hantel S, et al; EMPA-REG OUTCOME Investigators. Empagliflozin, Cardiovascular Outcomes, and Mortality in Type 2 Diabetes. N Engl J Med. 2015;373(22):2117-28. Post-approval cardiovascular (CV) safety trials are a requirement from Regulatory Agencies for compounds used for the treatment of Diabetes Mellitus (DM). The reason for this safety measure is to avoid potentially serious undesirable cardiovascular events that may result from the use of these agents in everyday clinical practice, as was unfortunately the case with Rosiglitazone. The intention of these post-approval trials is to ensure that the new anti-diabetic compounds are safe, mainly regarding hard CV clinical outcomes. We have to bear in mind that all agents developed for use in patients with DM are approved based on results from short-term trials with a surrogate endpoint, i.e.HbA1C levels. Until last year, not a single agent approved for DM treatment had been shown to have beneficial effects on CV outcomes such as CV mortality, myocardial infarction, stroke, or heart failure. The exception to this are, as reported recently, the drugs Empaglifozine and Liraglutide, which have been shown to be associated with improved CV outcomes in large clinical trials. Results of the EMPA-REG and LEADER (Press release only) trials are really promising and suggest that these agents can not only be used safely in patients with CV disease but may also improve clinical outcomes. The reasons/mechanisms for the CV benefit seen with these two drugs need to be further analysed. What is true however, is that we are entering a new era regarding the selection of anti-diabetic agents in clinical practice in patients with cardiovascular diseases. We concur that cardiovascular medicine physicians, in general, and cardiologists, in particular, both need to get involved in the care of patients with Type 2 diabetes mellitus (T2DM). Patients with T2DM comprise the adult population most prone to developing cardiovascular events and subsequent heart failure. Furthermore, T2DM is on the rise globally, not least also in developing countries (1). Most unfortunately, however, the treatment of T2DM has been bedeviled by a predominant focus on “treating the sugar” (2). This is in spite of the fact that there is no demonstrable link between glycated hemoglobin (HbA1c) target levels and cardiovascular events (3). Thus, it has been suggested that the concept of T2DM may be a category error, because the problem (heart disease) with T2DM has been wrongly assigned to a category (hyperglycemia) that is inappropriate to its solution (4). In our view, the task for physicians managing patients with T2DM would be to put emphasis firstly on cardiovascular health, in the setting of a patient centered euglycemic goal, rather than placing this goal as a secondary objective in the setting of glycemic control with an ever stricter, one-size-fits all guidelines for HbA1c levels. In accordance to cardiovascular trials in the field of cardiology, drug development programs in diabetes should move away from surrogate outcome trials (i.e. HbA1c) to trials measuring the effect on relevant hard cardiovascular endpoints. Type 2 diabetes which will soon effect up to half a billion people worldwide is a major risk factor for the development of chronic heart failure (CHF) due to left ventricular systolic dysfunction. In the USA alone 5 million individuals suffer from the debilitating symptoms associated with CHF and a similar number of people in Europe are living with CHF. Of these at least 25% will also suffer from type 2 diabetes mellitus. CHF not only leads to important symptoms it is associated with a progressive and often irreversible decline in LV function leading to death due to decompensated heart failure. CHF is also a strong risk factor for sudden cardiac death and its devastating consequences. The likelihood of suffering from both modes of death are increased substantially by the presence of type 2 diabetes. Improved survival after myocardial infarction, an ageing population and the rising prevalence of type 2 diabetes means that CHF is here to stay. Add to this, the cost to healthcare systems of CHF, with direct and indirect costs reaching 30 billion dollars per annum in the USA alone and we are confronted by a major healthcare challenge. The attached piece discussing The management of comorbidities by Amelia Carro Hevia is thus timely and important giving a good overview of diabetes treatments and CHF.